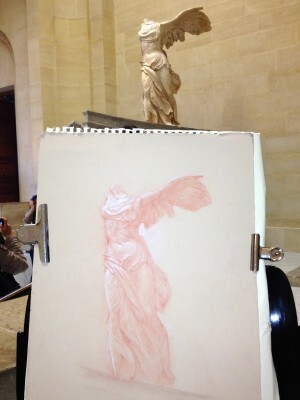 I have been lucky and immensely fortunate to draw at the Louvre Museum in Paris for a few years now. In doing so I have learnt some practical techniques and some aspects on how to use my time there productively. The Louvre was originally set up for artists, that means it is (usually) the most artist friendly museum I have ever been in. Anyone can walk in and draw with dry media, so there are always hundreds of artists working at the Louvre on any given day. You do not need permission and you will be in good company as there are many different people drawing. Large groups of chattering 6 year old children taking a class from their art teachers, students from Parisienne École des Beaux Arts, dedicated amateurs and art lovers with a passion, professional artists and indeed famous international artists. More information on the Louvre and its history here. It is a massive building, or rather series of buildings around courtyards, so it never really feels too crowded, although there are a few exceptions to this. In drawing from the antique we are following a tradition that goes back hundreds of years, that of studying and learning from past masters. Even if you have never drawn before, just sitting and looking at a sculpture or a painting can let it reveal to you something about what the original artist wanted to show you. In working in the galleries, there are some rules and regulations that you have to follow, but most are logical and indeed practical. Here are some of the things I have learnt and experienced, a few words on what is encouraged, and what is not allowed. If you are going to visit the museum for more than about 5/6 times in a year, then the most cost effective way is to become a friend of the Louvre (Ami du Louvre). With the Ami du Louvre Youth card for those under 26, you can get a card that costs a little more that just one visit, but you can go as many times as you like in one year, and for a few euros more the card can be upgraded for two people. Between 26–29, there is also a special rate card which can also be upgraded for two people. You do not need to bring a photo as they will take one, but you will need some identification. You can get these cards from the Amis du Louvre office located under the main Pyramid. The office is clearly marked and open every day except Tuesday, from 9 a.m to 5 p.m., and until 8 p.m. on Wednesdays and Fridays. For professionals such as educators, journalists and professional artists, there is an option that is even more cost effective. It is little more difficult to get this card as it cannot be issued by the Amis du Louvre office on the day, it will take two to three weeks and be sent to you by post. For further information, email their office at: louvreprofessionnels@louvre.fr. Or fill in and return their form found here. With any card there is also free access for a companion on Wednesday and Friday evenings after 6 p.m. To avoid the crowds, there is an entrance for card holders in the Passage Richelieu, off the Rue de Rivoli. This is most useful during peak times. With your card you can also get in to Musée Eugène Delacroix in Paris for free. See this blog entry about that museum for more information. The Louvre is open every day (except Tuesdays) from 9 a.m. On Wednesday and Fridays it is open to 9.45 p.m. Rooms are cleared about 30 minutes before closing. I have looked up to see three guards watching me, letting me have the last few seconds of drawing before ushering me out of the already empty gallery. You are not allowed to eat or drink in the galleries. However, as I am there for many hours, I do occasionally nibble a dry biscuit or sip some water. No melty chocolate though! I eat or drink away from any sculpture or art work, and discreetly. There are also many places to buy food in the Louvre, and with your Amis du Louvre card you will get a 10% discount. That is worth it as the food can be quite expensive. In the main restaurant (on the mezzanine on the left of the Richelieu side at the top of the escalator) there is a sink with a tap just to the right of the first food counter by the exit door where you can fill up your water bottle. There are also two microwaves (one at the front and one at the back of the room) that I have occasionally used them to reheat a lunch I have bought in. No one has mentioned I cannot do this. Discretion is the word here. You are allowed to take photographs for reference in the main areas of the Louvre, but with no flash. You cannot walk around with a selfie stick extended. People may also take photos of you while you are drawing. Some ask, some do not. Some seem to feel they are almost stealing something from you. They dash up, take the photo, then rush away saying nothing. Others are very formal and ask if it is ok to have their photo taken with you and with the drawing. You are not allowed to touch pieces of art work at the Louvre. People forget this, and will go up to a sculpture and touch it. If I see someone doing this, I do remind them politely that that is not allowed. Try not to plonk your stool down in the middle of the room, however perfect the view you have of the sculpture or painting. You will be asked to move by the guard. In general, it is a good idea to take a moment to see where the flow of people comes from, and try not to impede it. If you sit at the base of stairs or a place where there are a lot of people passing by, you will be interrupted by people asking questions, directions to the exit, or just wanting to chat with you. It might be best to try and find a corner, maybe with your back against a wall, or go to one of the quieter room out of the main thoroughfare. There are some benches that you could use to draw certain statues or paintings. However, you will be very limited in what you can choose to draw if you do that. You can sit on the floor, but this is not advisable for two reasons. One, it is cold marble, the other is that it will lower your line of sight to the work you are interested in. This can be especially adverse as some pieces are already quite high on plinths. However, the Louvre, unlike most museums, does not supply stools for you to sit on while drawing a study. The best way is for you to bring your own folding stool, but there is a certain type they allow. They do not allow those with tripod legs, or backs and they must not be too tall. They prefer those that have continuous legs in a loop, like the one shown here. These are easily available at most camping stores or online, and some are made of aluminium which decreases their weight. If you have not got a “correct” stool, and want to use one you have already, cover it with your coat and you should be alright. 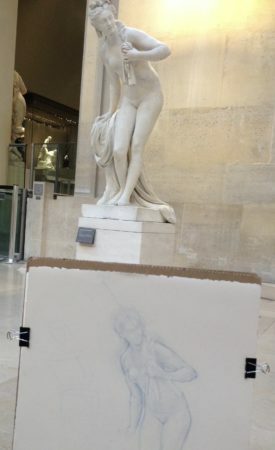 As you cannot bring any type of easel into the Louvre, you have to draw with a drawing board on your lap. A2 is the maximum they will allow, but realistically, A3 is better. I try and get an angle on the board in my lap by putting something on my knees under the board. A large square water bottle is ideal, or a rolled up scarf, or your bag. This helps you have a more accurate view of your drawing while working on it as doing this reduces the danger of strange proportions becoming apparent only when you look at it upright, as the angle of your drawing will be more inline with the angle of your vision. It also helps stop you crouching over your drawing, which can give you neck ache. Any items exceeding 55 cm x 35 cm x 20 cm are not permitted in the museum. If your portfolio is near to this size, and you are turned away by one guard, you can cross the courtyard under the Pyramid to another guard and they may let you in. It does seem to be somewhat discretionary. There are free lockers beneath the Pyramid for you to use if there is a problem. Some of these lockers are large and will easily take a medium suitcase or a large art portfolio. You cannot leave anything in them overnight. As you will be sitting still for a while, during the winter you can get very cold especially as there are mysterious drafts wafting around the Louvre. If you have a hat with a peak, that can help to stop extraneous light from above interfering with your vision, as well as keeping your head warm. I have a trusty scottish tweed flat cap. I also always take a large scarf or soft shawl, I will drape it over my lap or over my shoulders as needed. I do not mind if I look strange. Hey, I am an artist! The stools are not so comfortable for long periods, so I use my coat rolled up as a cushion. The crowds looking at the Mona Lisa. Not a good place to draw! 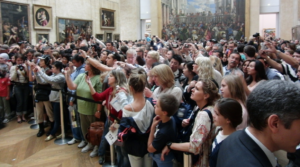 Mona Lisa is packed all the time as many people go to the Louvre just to see her. So that it totally impossible. Nike of Samothrace, also called the Winged Victory, is possible as the way she is displayed there are marble benches to sit on either side of her. She is beautiful to draw. I have also drawn the Michelangelo slaves, they are really difficult as there are thousands of people every hour passing through, but it is not impossible if you place yourself carefully. There are some benches under the window that you can use to give you a reasonable view. While drawing The Slaves however, I did make a huge mistake. I put my drawing on the floor for a second, drawing side up, and a tourist stepped on it but did not even notice! A big dusty footprint right in the middle of a painstaking drawing. My own fault. I carefully rectified it as best I could, vowing never to do something so foolish as that again. The guards are usually very accommodating at the Louvre. Especially when they see you are a “serious” artist spending days studying one piece. I have had one negative experience though. A guard told me that I could not sit and draw the Victory of Samothrace, even though I had been drawing her the day before and wanted to continue with the drawing. I do understand, as the Victory is one of the most visited statues in the Louvre and there are thousands of people in a day going to see her. But I had sat right at the back, well out of the flow of people. In the end, there was a stand off, but I stayed my ground. The next day I arrived to finish the drawing, bristling for another fight. But there was a different guard on duty, and this time he was most lovely and could not have been more accommodating. He even spent some of his shift moving people out of my line of sight, which I did not ask for and certainly did not expect. Plus he regularly came over to see how the drawing was coming along. For a short history of the Winged Victory look here. Artificial and natural light competing at the Louvre under the canopy in Cour Puget as the natural light gets dim, and the artificial lights turn on. Natural lighting is the idea, especially for viewing paintings. This is not always possible. Some of the sculptures are in cabinets that have many directional lights on them casting ugly shadows. This make them difficult to draw. Sometimes, when you are in a dimly lit area, you do not have enough light on your drawing board itself. A clip on reading light, especially one with a flexible neck, is useful here. They are not colour neutral, but for a drawing, that should not be too much of a problem. If you are under the grand glass canopies in the large courtyards such as the Cour Marly or Cour Puget, you should have good natural daylight flooding the sculptures. However, there are artificial lights that turn on automatically when the natural daylight level gets low. This can mean in winter that the lights can go on and off a few times before coming on for the evening, changing the colour temperature and the direction of the shadows on the statues. People will see you as part of the Louvre. You are creating art from the art at Louvre, so I think you become part of the Louvre. They will ask you where the Mona Lisa is. They may engage with you about your work. If you do not want any interruptions, wear head phones. But in a way I feel this is a shame. 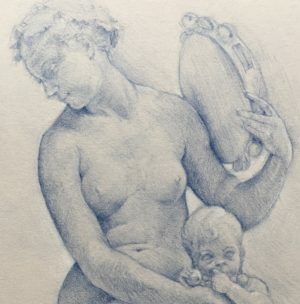 People show a great interest in traditional classical drawing, and some are amazed that there are people who are still doing it. You do get to hear comments in every language, luckily I do not speak most of them so do not know what they are saying. People will assume you are French, and most are delighted when you speak to them in English. I have had a few strange things happen. A very smart elderly aristocratic Roman, complete with jaunty felt hat and colourful cashmere scarf, wanted me to go to his birthday party, tempting me with Champagne no less. Or the young Korean (male!) student who wanted to know how much it would be for me to draw him, how shall I say this . . . au natural. Then there was the class of 6 year olds who crammed right around me all trying to look at what I was doing while the teacher talked about drawing. Suddenly, quick as a flash, a little hand darted out and rubbed across the surface of the drawing. The teacher was mortified, but no harm was done. I also had two of the sweetest young French girls trying to talk to me, but when I could not understand everything they said, I told them I was English. They huddled together and whispered to each other, turned to stand right in front of me formally holding hands, and sang a Christmas Carol in schoolgirl English. It made my day. 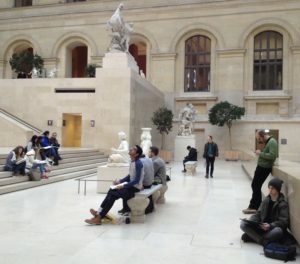 Studio Escalier runs excellent drawing courses that have afternoons at the Louvre. More information here. For more of my drawings at the Louvre, look here.